﻿ Villas de Jardin Kepulauan Seychelles. JIMAT di Agoda.com! Ada soalan mengenai Villas de Jardin? Direka untuk kedua-dua tujuan perniagaan dan percutian, Villas de Jardin terletak di lokasi strategik di Pulau Mahé; salah satu kawasan yang paling popular di bandar tersebut. Keseronokan pusat bandar hanya sejauh sahaja. Juga terletak berdekatan adalah Taman Nasional Morne Seychellois, Pusat Menunggang Utetangar, Taman Marin Negara Baie Ternay. Di Villas de Jardin, segala usaha dilakukan untuk membuatkan tetamu berasa selesa. Oleh yang demikian, hotel ini menyediakan perkhidmatan dan kemudahan yang terbaik. Wi-Fi percuma semua bilik, simpanan bagasi, tempat letak kereta, pengangkutan lapangan terbang, bilik keluarga merupakan beberapa kemudahan yang membezakan Villas de Jardin daripada hotel-hotel lain di bandar. Hotel-hotel telah direka demi keselesaan dan memudahkan tetamu. Sebahagian bilik menyediakan internet wayarles (percuma), bilik larangan merokok, penyaman udara, panggilan kejut, beranda/teres. Di samping itu, pihak hotel menawarkan aktiviti rekreasi untuk memastikan anda mempunyai perkara untuk dilakukan sepanjang penginapan anda. Apa juga tujuan lawatan, Villas de Jardin merupakan pilihan yang terbaik bagi penginapan anda di Kepulauan Seychelles. All was perfect! Sparkling clean Fantastic view from the terrace Nice an quiet location A car is recommended since you donvt have many restaurants in the area Guest was nice and provided us towels and let us shower even after the check out. Absolutely fantastic. 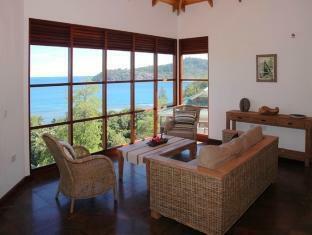 The view I stunning, the infinity pool is great and the veranda is spacious and private. Spotless rooms and a very comfortable bed. Great value for money. Miss the place already. We will be back! Perfect holiday setting. 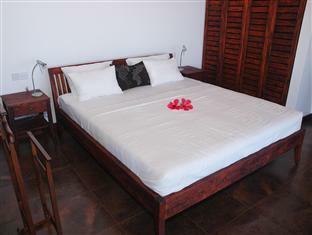 Set in beautiful garden full of tropical flowers and boulders with a lovely view of the sea, the hills and lush forest. There is also a decent infinity pool. You get a welcome pack of water and breakfast, some toiletries, mosquito coil and fresh flower blooms. You can take beach towels to the beach. Everyone is friendly. Ulrike, the managers is really amazing. A well of information, extremely helpful and friendly, on top of everything and makes sure everybody is at their best. We also received a complimentary bubbly for a birthday celebration, a thoughtful and unexpected touch. There are giant turtles by the reception. The beach at the bottom is lovely but not for swimming due to biting sand flies. A good beach is a short bus journey away. There are frequent buses going by. At the bottom is also a small shop. Highly recommended. Excelent place! Apartament was clean and cozy. View from terace, pool - amazing! Book it and you won't regret it! Beatiful view, stunning pool, welcoming staff and a great location. Amazing experience. The location is stunning and the rooms are even better. We highly recommend it. We enjoyed it very much. The staff were lovely and helpful, always going out of their way to help and make our stay more interesting and comfortable. Room was lovely, very clean and modern. Very peaceful area with plenty of privacy. Just like be at my home,beautiful villa with great view from the balcony!we enjoy the peace cause every single villa enjoy a specific private place!good stuff and if we visit seychell next time, we will definitely stay de jardin! The view was great, staff were helpful and room was cleaned on a regular basis. The stay was brilliant. Rooms were cleaned everyday. The view was amazing from our secluded and spacious villa. The layout of the villa was very good with a big lounge and kitchen, a separate bedroom and a big and modern bathroom. The villa was equipped with an alarm system as well. We really enjoyed sitting on the large balcony every day. Ulrike, the German Manager of the villas was very nice and helpful too. This villas are very nice and beautiful, they are modern and made with good taste. The view is charming - Indian ocean on your palm. Ulrike is the kindest and the most hospitable person, I've met. Whatever you need you can be sure to receive full support. This villas sure fully equipped with everything we may need. After staying in luxury hotels prior to our stay here, this self catering apartment did not let us down. The room and facilities were just as nice as our hotel rooms had been in all fairness. The apartment felt luxurious and has been beautifully designed, all 7 units sit on the hill side and face out to sea which is a real plus. The shared pool was small but a great addition to the apartment. And we had it to ourselves both times we visited it. The apartment was cleaned and fresh towels put out daily, which was also a great addition. And the staff were really welcoming and helpful. I would highly recommend this to anyone looking for self catering apartments on the island. The open terrace ,the outdoor shower and the spacious living room. This villa is really a steal for it price. Strongly recommended!!! Forget about other 5 stars hotel or villa. Check out villa de jardin and you will never regret staying there:) The hotel manager is really helpful.